A customer buys marijuana at Harborside dispensary in Oakland, Calif., on Monday. 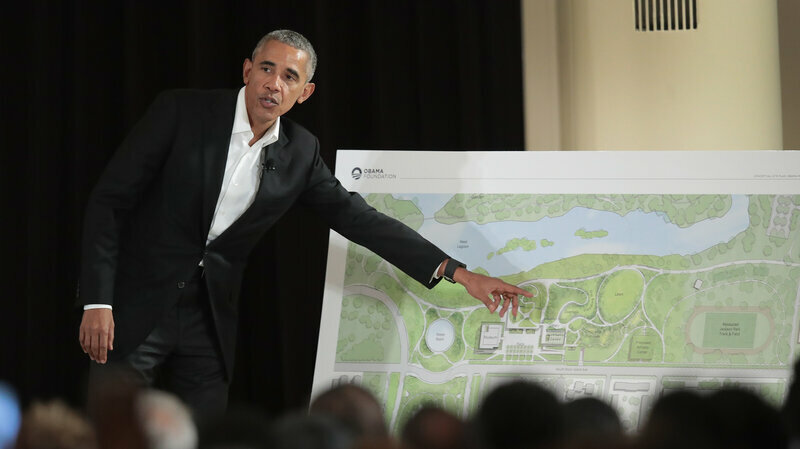 At a ceremony last May, former President Obama points out features of his proposed presidential center, which is scheduled to be built in Chicago. It is not the only honor that awaits the former president in the state he served as a senator: He's also getting a day designated in his honor. Across the country, U.S. residents have awakened to a new year, new resolutions — and a whole host of new rules to keep track of. Hundreds of new state laws took effect across the country Monday, and they&apos;re sure to reshape the political and legal landscape in the coming months. They run a vast gamut — from recreational marijuana and paid leave time, to traveling barbers and exotic pets — so you&apos;ll have to forgive us if we pick just a few to focus on. Here is a glimpse of some notable new laws, in brief. The Golden State has joined a small but growing list of states to legalize recreational marijuana use. As of 6 a.m. local time Monday, licensed retailers were legally allowed to begin selling the substance to customers age 21 and up. And they didn&apos;t lack for customers. "Some people stayed up all night to get a spot in line. Others went to bed early to get there before 6 a.m.
"Anthony Moraga, 28, drove from Merced on Sunday so he could be in line at 4 a.m. — the first customer in line at Berkeley Patients Group. But he was the second to make a purchase. The store had selected longtime activists Conrad and Norris to be first." The day comes more than a year after California voters passed Proposition 64, which mostly decriminalized marijuana there. Previously, the state had only allowed sale and possession of the substance for medicinal use. Still, even with weed legalized, it bears its fair share of regulations. The state has set up a specific agency, the Bureau of Cannabis Control, to grant and monitor licenses to retailers. Adults over 21 can only possess a maximum of one ounce of bud and up to eight grams of concentrates, and they cannot smoke in vehicles or public places. And then there are the state taxes that commercial buyers must pay — and that authorities believe will offer a windfall for state coffers. As NPR&apos;s Ina Jaffe reports, recreational marijuana is expected to bring in up to $500 million in the first year alone, and some estimates place the eventual revenue as high as $1 billion a year. Nevertheless, marijuana remains illegal under federal law — and as such, Border Patrol will continue to seize the substance at checkpoints. Washington on Monday became the seventh state — in addition to Washington, D.C. — to require employers to offer paid sick leave to their workers. Rhode Island is set to become the eighth to do so later this year, when its own law takes effect in July. And in Nevada, employers are now required to offer up to 160 hours of leave per 12-month period to workers who have been — or whose family members have been — victims of domestic violence. The federal minimum wage, however, is set to remain steady at $7.25 per hour. And, as Sullivan points out, the five states that have the highest percentages of hourly workers earning the federal minimum or below have no plans for a wage hike this year. Tennessee is implementing a measure granting broad free speech rights to speakers on higher education campuses, wading into a debate that has flared into national focus lately. The law marks an implicit response to the protests that have surrounded — and even derailed — recent speaking engagements by incendiary figures such as Ann Coulter and Milo Yiannopoulos, among others. Several states are making changes at the ballot box. Iowa and West Virginia both adopted measures that require voters to show an accepted form of ID, though the former&apos;s law won&apos;t be fully phased in until 2019. Texas, which had a similar law from 2014 tossed earlier this year by a federal judge, is adopting a revised version of the measure — which allows people to cast a ballot without ID, but only if they swear they could not reasonably obtain one in time. Elsewhere, multiple states are changing their rules regarding how gender is recorded in official documents. In Illinois, for instance, transgender and intersex people are allowed to change the designation on their birth certificates, provided they do so with the approval of a medical professional. And in California, residents are no longer required to choose between either "male" or "female" on their ID documents. Not every new state law bears weight of national import. In fact, the vast majority are of a more, well, specialized nature. That said, here&apos;s a little selection of some that stand out anyway. In South Carolina, for example, people hoping to buy a Siberian tiger to celebrate the new year are likely to be disappointed: As of Jan. 1, it is illegal in the state for typical residents — that is, if you&apos;re not a zoo — to buy or own exotic animals for pets. That&apos;s right, no more apes, lions or polar bears to stalk your residence in captive splendor — unless you happen to be one of the estimated 25 South Carolinians who already own such an animal, according to the Myrtle Beach Sun News. The local paper notes that those owners will be grandfathered in, albeit with new restrictions. As the Humane Society pointed out, before the bill&apos;s passage, the state "was one of only five states with virtually no laws regarding private possession of dangerous wild animals." Illinois has set aside a day in honor of one of its best-known politicians: former President Obama. Henceforth, the state&apos;s former senator will be honored with Barack Obama Day every year on his birthday, Aug. 4. It should be noted, though — if you live in Illinois, don&apos;t expect a day off from work or school, since it is considered a "commemorative date" rather than an official holiday under state law. And then, it&apos;s worth returning to Tennessee for this note: If you&apos;re a barber in the state, you are now legally free to pay house calls. Previously, barbers were only able to do so for clients "who are actually ill"; now, even those with perfect health won&apos;t need to leave their front door to get a good haircut. Of course, as long as this list may be, these laws are but a few of the hundreds newly on the books across the country. It&apos;s best to check in your own state to be sure what new rules, exactly, now apply to you.